Funny Motorcyclist Gets Off His Bike To Dance at a Red Light! - Muscle Cars Zone! Funny Motorcyclist Gets Off His Bike To Dance at a Red Light! A funny motorcyclist demonstrating his slick dancing moves at traffic lights has been recorded on camera. The entire biker`s dancing demonstration has gone completely viral, collecting a lot of views around the world. This hilarious video was from the dash camera on a driver following the biker. Apparently, he was just driving back home on a Friday when suddenly the biker leaped off his bike and began dancing. The motorcyclist is dancing to the slick music of the vehicle in front. The biker perfectly timed his jump back onto the motorcycle to ride away. 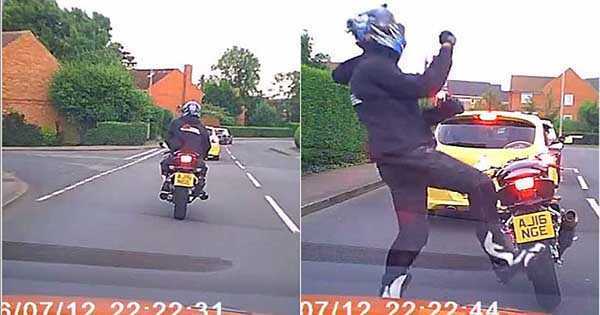 It looks like this biker is not the first one dancing at a red light. You can find videos of various motorcyclists doing the same thing on the internet. In fact, there is a special trend started on Facebook called the “red light challenge” which many decided to take part in. We think this is a pretty interesting trend that manages to entertain many people around. We see nothing wrong in that. Just imagine driving back home on what you think it was just an average day and the biker in front of you starts dancing to some cool club music? That would be a sight that can make your day slightly better. Having said that, we hope this trend won`t be over any time soon. Why stop when there is nothing but positive feedback regarding this challenge. In a world filled with so much negativity and depression, it`s cool to see this funny motorcyclist having fun like that. Oh, and finally the video of people dancing to Vengaboys!